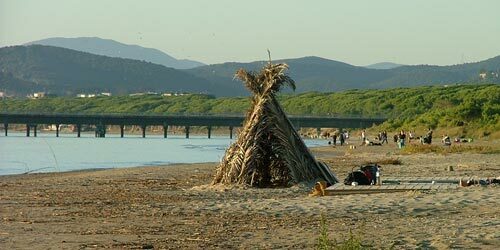 Thinking of camping at the beach in Maremma in Tuscany and Lazio? 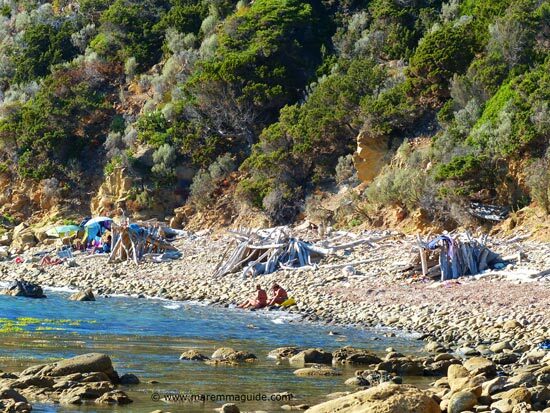 Whether you have a tipi like this couple on the Puntone di Scarlino beach, or a more modern dome or backpacking tent, you should be aware that camping on the beach in Maremma is illegal. Although some visitors do pitch their tents, at a minimum they risk being moved on and scolded by either the Municipal police (if the beach is a "public beach" - link below to information about private and public beaches in Italy) or officers of the Corpo Forestale dello Stato - the State Forestry Department (if the beach lies within a reserve or national park as most of Maremma's beaches do). At worst, they risk a fine. Lighting fires on the beach in Italy is also not permitted, although if you walk along the Maremma's beaches you will sometimes find evidence in the mornings of those that have and not taken sufficient care to clean away the debris. Again, the penalty is a fine. That said, I know that many a sub-aqua Tuscan fisherman's dream weekend is to spend the day fishing with friends, and then to cook together the fish they have caught over a drift-wood fire in a secluded cove... and pass the night sleeping under the stars. Boys! The - legal - alternative if you want to sit on a Maremma beach (they are some of the most beautiful in Italy) and watch the ocean and beach sunsets with dinner or a bottle of wine... and then wake in the morning and dip your toes in the waters of the baby blue and turquoise waters of Ligurian and Tyrrhenian seas whilst sipping your morning coffee... are Maremma's campsites on the beach. There are many to chose from as the majority of campsites in Maremma are concentrated along her spectacular 250 kilometre long shoreline and gorgeous beaches. They range from four star facilities with over a 1000 pitches within a complex of chalet type bungalows, shops and restaurants, to the simpler one star family-run campsites that cater to tent and camper van holiday-makers. My particular favourites are the new lodge tents on Capalbio beach - a fantastic idea by the owners of Il Campeggio di Capalbio - with individual shady decked terraces and your own en-suite bathroom :) A taste of African safari camping in Maremma! Most are home for the summer for Italian families from nearby Firenze, Siena, and Roma, who return year after year to spend July and August on the beach.